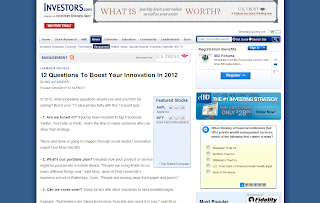 It’s no secret that many companies are striving to be more innovative in 2012. But today’s business climate demands companies do more than just ship new products. Rather, companies are being challenged to disturb the status quo, reinvent business processes, address unmet customer needs, create new markets, and take leadership roles in building those markets. Innovation in 2012 isn’t about just generating new ideas. It’s about bringing the right ideas to market — and doing it faster than your competitors. Amy assembled a good list of questions you should be asking yourself to determine how you and your business can be more innovative in the new year. Take a look, and let us know what you think in the comments section here. Anything you’d add? While this quiz helps get the wheels turning on this topic, there’s much more to delve into. Several of my colleagues, along with myself, have been discussing the notions of creativity, innovation, and leadership lately, especially how they relate to education. We’re planning to share our thoughts in a new series on our blog, Creativity/Innovation/Leadership. Although we’ve talked about these topics separately on our blog, we’re going to explore how they relate to one another, and what they mean collectively for education in 2012. More to come soon! You can bookmark our Creativity/Innovation/Leadership tag to follow our series, and watch for the next post as soon as it hits.